These girls are members of the 2018-19 Marysville High School wrestling program. They are from left, Emily Segner, Layla Oribello, Madison Sharpe, Zoe Tornberg and Emma Swart. The Marysville High School wrestling program has a slightly different look this season. That’s because there are five girls on the 50-plus person roster for head coach Shawn Andrews. The ladies are juniors Madison Sharpe and Layla Oribello and freshmen Emma Swart, Zoe Tornberg and Emily Segner. Andrews said he was not at all adverse to having girls join the team. “Wrestling is for anybody and the lessons you can learn from the sport are not limited by gender,” he said. The first female of the group to express an interest in joining the team has a familiar last name. “Madison had expressed an interest in wrestling a year ago,” said Andrews. Sharpe’s older brother Deric was a very good wrestler for the Monarchs a handful of years ago and capped his career with an appearance in the Division I state tournament. Most of the girls became interested in the mat sport through either family or friends. “Both my dad and mom wrestled at Marysville,” added Tornberg. “Dad (Jeff) wrestled two years here and Mom (Megan Bumgarner) also wrestled. Segner comes from a wrestling family as her dad Brent wrestled as a high school athlete in Westerville, while Oribello said her father Norman wrestled in high school in California and her brother Landon competed at Pickerington Central. “I also wrestled in the youth program at Pickerington North when I was younger,” said Oribello. All of the girls said there are different things they enjoy about the sport. “It’s an individual sport, but it brings people together as a team,” said Tornberg. “It’s a challenging sport and it’s brought the five of us together as friends,” added Segner. Wrestling can be grueling for the most experienced of matmen. The ladies are finding that out as well. “All of the training and practices are hard,” said Sharpe. While the training can be intense for the most experienced grapplers, the first-year high school wrestlers don’t receive any breaks from the coaching staff. “Everyone is treated the same,” agreed Swart. Still, wrestling is a physical sport in which the threat of injury is always present. Segner found that out the hard way. Segner’s arm was in a sling/brace during the recent interview and she acknowledged that she will be out of action for the foreseeable future. The others have similar goals for the 2018-19 season. “I just want to try my best and not give up,” said Sharpe. Swart said she wants to push herself and improve every day. Despite the challenges of being a female in a predominately male sport on the local level, the girls feel there are benefits to be gained. “It teaches you discipline and self motivation,” said Oribello. It’s up in the air just how many matches each of the girls will compete in, since they are all basically in the same weight class at 106 pounds. Still, one or more of them will see varsity mat action. 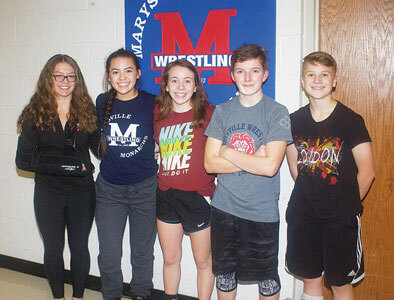 The girls as a group can be seen as pioneers for Monarch wrestling and they very well may open doors for future girls on the roster. “Women’s wrestling will only continue to grow,” said Andrews. “A total of 15 states have already adopted a girls’ division for high school wrestling.